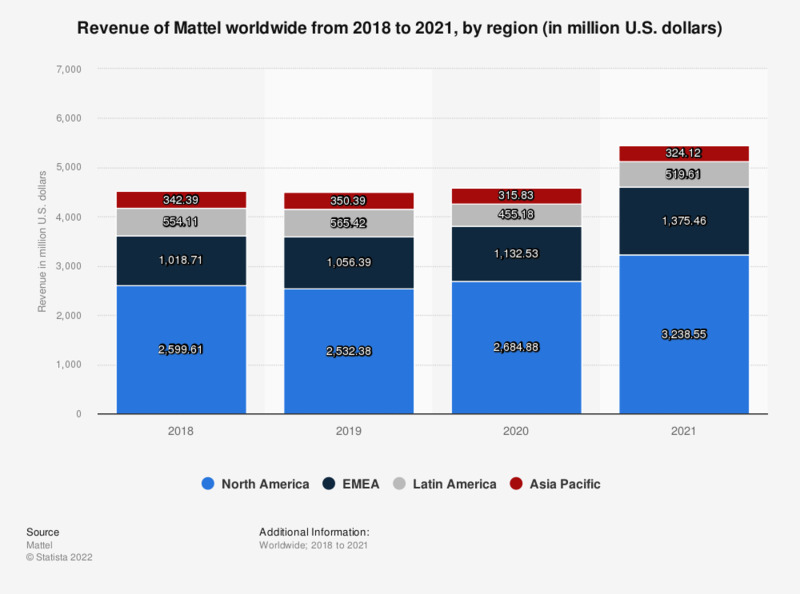 This statistic shows the annual gross sales of the toy manufacturer Mattel by region worldwide from 2009 to 2018. In 2018, Mattel generated gross sales of about one billion U.S. dollars in Europe. Mattel, founded in 1945 and headquartered in El Segundo, California, is a toy manufacturing company that produces and sells children’s toys such as dolls, action figures, games & puzzles, toy vehicles and youth electronics. Among the brands that Mattel owns are, for example, Barbie, Hot Wheels, Fisher-Price, Matchbox and Disney Princess. In 2016, Mattel generated 5.46 billion U.S. dollars in revenue, slightly behind Lego but ahead of it's other competitors, which include companies such as Namco Bandai and Hasbro. The U.S. American company has offices and facilities in 36 countries worldwide, including marketing and sales subsidiaries in Asia, Europe and Latin America. Its manufacturing plants are located in India, China, Italy, Indonesia, Malaysia, Thailand and Mexico. In 2001 Mattel closed down its last manufacturing plant in the United States, which had been located in Murray, Kentucky. The United States though is still Mattel’s biggest and most important sales market. In 2014, sales in the U.S. market generated 3.66 billion U.S. dollars of Mattel’s total gross sales. Europe and Latin America, with 1.69 billion U.S. dollars and 909 million U.S. dollars in gross sales , are the second and third biggest sales markets respectively. The biggest customers of Mattel are Wal-Mart, which bought products worth around 1.1 billion U.S. dollars from Mattel in 2014, Toys’R’Us (0.6 billion U.S. dollars) and Target (0.5 billion U.S. dollars). More statistics and facts on toys. *Source provides the following information: Mattel reorganized its regional reporting structure in the first quarter of 2018. As a result, Global Emerging Markets, which was previously disclosed as Asia Pacific, includes Russia, Turkey, the Middle East, and Africa, which were previously included within Europe. Prior period amounts have been reclassified to conform to the current period presentation.